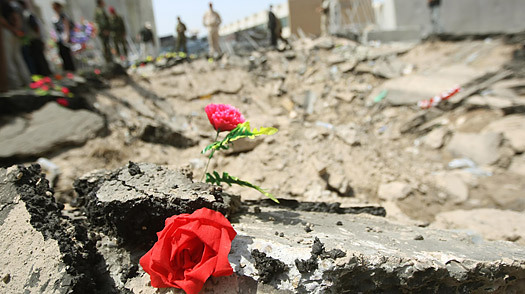 Plastic flowers are placed along the rim of the blast crater by relatives and friends of victims of the bomb site outside the Foreign Affairs Ministry building in central Baghdad. DAMASCUS, Sept 27 (Reuters) – The United States has invited a Syrian official to Washington for the first time in five years as part of its efforts to improve relations with the Damascus government, a U.S. official and diplomats said on Sunday. Deputy Foreign Minister Fayssal al-Mekdad will visit Washington on Monday to discuss Iraq and U.S sanctions on Syria in a move that could help a slow rapprochement between the two countries, started by U.S. President Barack Obama soon after he took office in January, the diplomats said. The visit comes as tension between Syria and Iraq grows, with Baghdad accusing Damascus of harbouring Saddam Hussein followers suspected of being behind deadly attacks in Iraq. The United States sent a security delegation twice to Damascus this year to discuss cooperation on Iraq and steps that Syria could take to prevent infiltration of fighters and supplies through its borders into Iraq. But Iraq withdrew its ambassador from Syria after two bomb attacks in Baghdad on Aug. 19 killed 95 people. Damascus, which denied having a link to the attack, responded in kind. The Syrian government has also refused to hand over wanted members of the Iraqi Baath Party living in Syria, saying it was not convinced of the evidence against them. A suspected Syrian role in foreign fighters’ infiltration in Iraq was behind U.S. sanctions on Syria that were imposed following a 2004 U.S. law, as well as Syria’s policy toward Lebanon and support for Palestinian militant groups. The United States wants Syria’s help in forging a deal between Israel and the Palestinians through its influence on the Palestinian group Hamas, which is opposed to President Mahmoud Abbas’s approach to talks with Israel. In Lebanon, Washington wants Syria to help in the formation of a new government led by its ally Saad al-Hariri, son of Rafik al-Hariri, a well connected Lebanese parliamentarian and former prime minister who was assassinated in Beirut in 2005. Washington had blamed Syria for instability in Lebanon in the past and withdrew its ambassador in Damascus following the Hariri assassination. The U.S. State Department announced in June that a U.S. ambassador would be restored to Damascus without giving a date. “Obama has to have something to show for his overture toward Syria, and the Syrians may have to deliver more,” one source following the talks between the two sides said. Another source said Syria expects the United States to push Israel to resume peace talks with Damascus, which were suspended last year. George Mitchell, Obama’s Middle East peace envoy, had visited Damascus twice but Syria was not included on his latest trip to the region this month. Hamas leader Khaled Meshaal, who lives in exile in Syria, is expected to go to Cairo this week for talks with Egyptian officials about new proposals by Cairo to bring about a reconciliation between Hamas and Abbas’s Fatah faction. The blue-domed memorial Saddam Hussein built in Baghdad to honour Baath party founder Michel Aflaq, a Syrian Christian who started the movement that dominated Iraq for decades and governs Syria today, has been turned into a shopping centre for U.S. soldiers. Aflaq’s tomb, sitting at the centre of a vault adorned with Koranic verses and Arabesque designs, has been boarded up to make way for a barber shop, a store selling kitschy Iraq souvenirs, a pirate DVD vendor and a ring of other stores. The new mall at Aflaq’s tomb, located on what is now a U.S. military base in central Baghdad, has thus sealed off a powerful symbol of the deep, and often strained, shared history between Iraq and Syria, one which is being tested in a new feud between Baghdad and Damascus. Last month, Syria and Iraq recalled their ambassadors after Iraqi Prime Minister Nuri al-Maliki accused Syria of sheltering members of the Iraqi Baath party whom he blames for backing attacks that killed around 100 people in Baghdad last month. The Aug. 19 bombings marked a U-turn in the slow improvement of relations between Iraq and Syria, which for decades had stunted diplomatic relations. Since 2003, they have been at odds over U.S. and Iraqi accusations that Damascus has allowed foreign insurgents to stream across its border into Iraq. Damascus refused Maliki’s demand that Syria turn over Iraqi Baathists believed to be behind the August attacks and accused Iraq of being ungrateful for its efforts to care for hundreds of thousands of Iraqi war refugees now living in Syria. But Syrian President Bashar al-Assad must be unnerved by Maliki’s request at the United Nations for a formal inquiry into the attacks. Shining a global spotlight on Syria for a second time – in addition to the U.N. tribunal into the death of former Lebanese Prime Minister Rafik al-Hariri – must be an uncomfortable prospect for Assad’s secretive, controlling regime. The Iraq-Syria squabble also underscores the difficulties that Maliki, and Iraq generally, are having in dealing with powerful elements from the Iraqi Baath party, many living in Syria and Jordan, ahead of an election next year and beyond. The United States has been pushing Maliki to bring a wider spectrum of Iraqis into efforts to reconcile the country, and has even held unilateral talks with former Baath party members who might one day try to take part in the political process. But Maliki, a member of Iraq’s Shi’ite Arab majority marginalised under Saddam’s Sunni Arab-led regime, spent decades fighting the Baath party – at least in part from exile in Syria – and it will be hard for Sunnis or Shi’ites to easily forget the sectarian crimes of the last six years. Which brings us back to Aflaq. Born in Damascus in 1910, Aflaq was educated in Paris before he helped found the Baath party in the 1940s, hoping to wed Arab culture with modern, secularist politics and a rejection of western imperialism. The Baath party took over in Damascus in 1963, but Aflaq later fled to Baghdad and aligned himself with the rival Iraqi branch of the party. Saddam gave Aflaq, his ideological compass during 24 years in power, a place of honour in Iraq and named him the party’s general secretary. In 1989, Aflaq died in Paris – Saddam claimed he was secretly converted to Islam before his death – and he was buried in Baghdad. During that time, Syria and Iraq spied on and used political dissidents as leverage against each other. What the two countries may share most now is the need to climb down from their latest neighbourly crisis. Assad’s government is reaching out to the West and Washington, under President Barack Obama, is seeking to engage Damascus for the first time in eight years. Maliki, meanwhile, is facing push-back on his tough Syria stance from senior officials who could well turn out to be rivals in January’s national elections. Struggling to stamp out a weakened but active insurgency, Maliki may also not want to risk anything that will further deteriorate security and undermine his main selling point – improved security – when voters go to the polls in January. The current leadership in Iraq lacks any real backbone or authority. It is generally lopsided to favor one of the three main groups. I assume everyone knows which one I mean. It would be to the government’s benefit to allow experienced politicians (willing to reconcile their differences) to come back and play a role in the rebuilding Iraq. The government will never be taken seriously until it can show a united front to the world and its own people.